Just a question whether or not anyone reproduces the rural Police Shako? I have heard they are being reproduces but who is still a mystery. I have an original lined up for my collection but curious if anyone knows is there are repro's out there. I looked into this a few years backthere was a guy made a couple to special order but i dont know who it was and in any case the price quoted was more than a reasonable origional. I do have an origional but rarely take it to events owing to the scarcity and value and the couple i did take it to it nearly got smashed. Following on from that i have been looking for a tunic in the proper Police green for years with no luck, though i have managed to get some trousers and Britches. Remove the chin strap and fixing and the plate then it should be easily converted. What do you think? You need to remove the cockades from under the chin strap fixing points as well mate and replace the front cockade with the correct one, also the body cloth is the wrong colour though it could be the photo, looks more grey than police green which is what it should be also the top and visor colour appears to be to light. Personaly i woudnt bother trying to convert it as a badge alone wil cost you a couple of hundred for a good genuine one and to replace the body covering with police green would be a pain in the arras and never look good. Heres some pictures of mine mate. 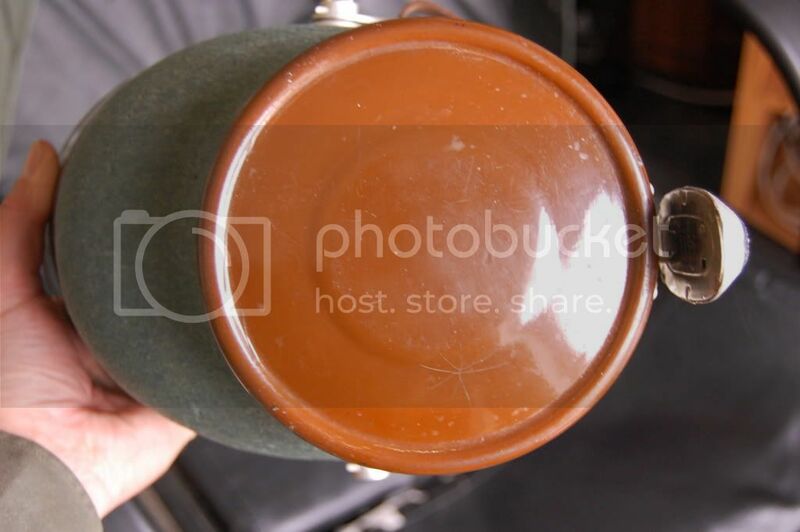 Very very nice Shako and in superb condition. The brown leather really is the more attractive. Really looking forward to adding one to my collection. Thank you for sharing the photo's mate. John i will consult my reference books before i answer the question directly mate, however meanwhile some info. Pre war when the german states had independant police forces several of them wore all black Shako,s though with there own states badges good references for the police are John Angola and Hugh Page Taylors books Uniforms, Organisation and History of the German Police in 2 vols from Schiffer publishing. 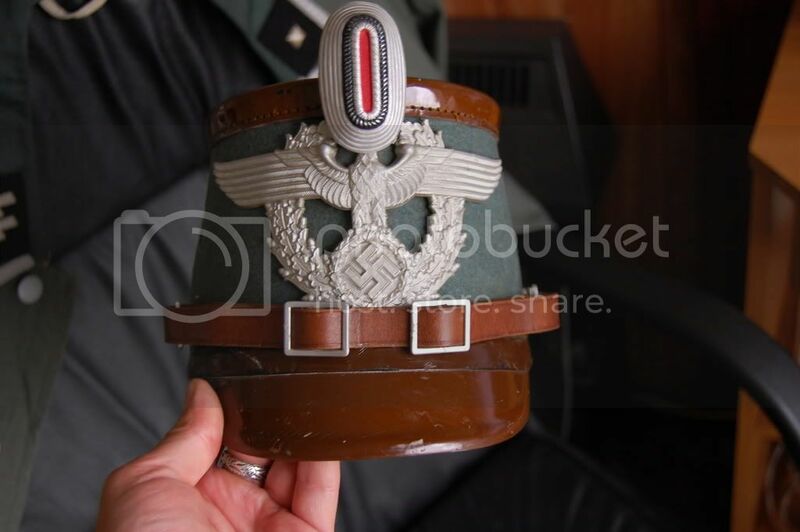 John so far as i can acertain yes the Hilfspolitzei wore the all Black vulcan fibre shako after 1940 though i can find few photos of it being worn and yes a good many post war ones are passed of as war time for bloody stupid money. Luckily the Treasure Bunker have their own mini forum and just spoke to the owner so chatting with him. 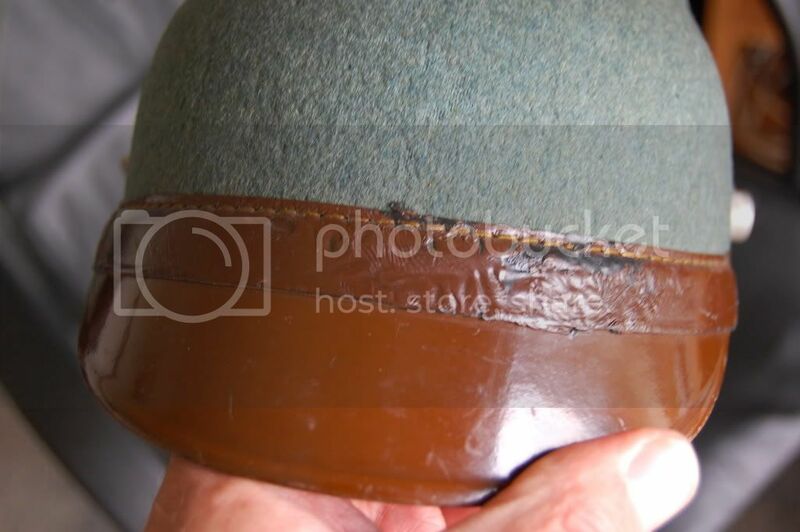 Will pop into Glasgow and speak to him during the week and take a look at the Shako.